I have a deep love for anything sweet potato (who doesn't). Sweet potato fries, sweet potato chips, mashed and baked sweet potatoes...well the list stops there because I can't think of anything else sweet potatoed. Fortunately I came across this recipe on Pinterest and immediately bought the ingredients. 1. First of all you have to make your sweet potato puree and it is super simple. I peeled my sweet potato, cut it into cubes and boiled them until it was tender. 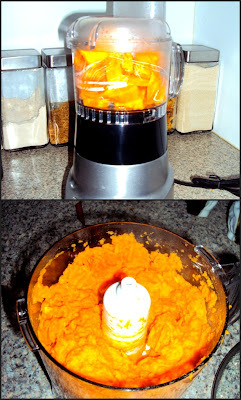 Next up I blended them in our food processor to get the consistency of baby food or mashed potatoes. 4. Sprinkle with salt, sugar, paprika, or whatever your heart desires. Place on a baking sheet (I used tin foil) and bake at 350 degrees for 8-12 minutes. Flip the crackers and bake for another 4 minutes. The present and stocking cookie cutter was a fail. The crackers were random blobs but still yummy! P.S. I actually made sweet potato bread last night with my leftover puree and will be posting the recipe soon! P.S. New follower on Pinterest! These look so good! I am going to have to make these! yum!!! love it! pinterest has THE best recipes! Definitely trying this recipe out!